Braemar is an attractive, long established, central yet quietly situated, Victorian character residence offering comfortable and homely accommodation within easy reach of the many famous attractions Buxton & the Peak District have to offer. Check in is between 16:00--23:00, Please contact us if you wish to arrive outsisde these hours and we will do our best to accommodate you. Children welcome from age 12. 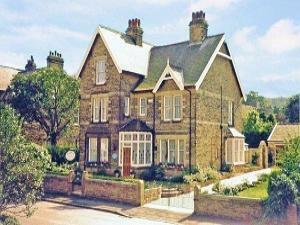 Braemar B&B sometimes limits bookings to 2 or more days. Attractive, warm and welcoming. An en-suite room with a `Kingsize` bed and seperate pedestal recess.Cheerfully furnished with a cosy atmosphere. West facing. En-suite shower with complimentary toiletries. Breakfast prepared using fresh local produce. 1 night stays may be possible at weekends 24 hours prior to date , please enquire. BASED ON AN OCCUPANCY OF 2 PERSONS INCLUDING FULL ENGLISH BREAKFAST. Double en-suite sometimes limits bookings to 2 or more days. Convenient and cosy,warm and welcoming. Again an en-suite room with a `Kingsize` bed offering all the usual touches to help you relax after a full day exploring Buxton and our beautiful Peak National Park. Full tea and coffee making facilities . Breakfast prepared using all fresh local produce. 1 night stays may be available over weekends 24 hours prior to date, please enquire. Double ensuite. sometimes limits bookings to 2 or more days. 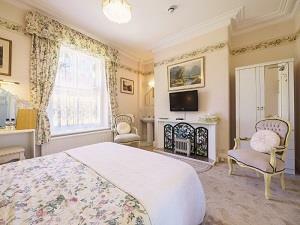 A light, bright airy room with a 'Kingsize' bed, antique pine furnishings, period mirrors and full pedestal recess. Cosy and warm decor.This room benefits from its own exclusive private shower and toilet facilities which is a pace across the landing. Bathrobes supplied. 26 inch flatscreen TV with all freeview chanels . Breakfast prepared with all fresh local produce. 1 night stays may be available at weekends 24 hours prior to date, please enquire. Double/single sometimes limits bookings to 2 or more days. From the A515 Ashbourne Road, pass the Esso Filling station on your right and take the next left turn into Mosley Road. (Braemar directional sign). Compton Road is the next right turn and Braemar is on your left. From A6 Bakewell, go left at Morrison's roundabout and then at Fiveways traffic lights, take the second left in to Green Lane and then the first left into Compton Road. Braemar is on the right Hand side. From A6 Manchester, go left at the first roundabout and right at the second Morrison's roundabout and then follow directions above. All buses stop at the Market Place, a 5 minute walk from Braemar Guest House. The nearest railway station is Buxton station, a 10 minute walk. Decor was lovely and homely, and rooms were absolutely spotless, and I always check. Wonderful, even left chocolate in the room instead of biscuits as they knew I was gluten free, marvellous! !